President Taylor felt strongly about order and organization within the priesthood, teaching that the priesthood “is a pattern of things in the heavens” and the means “through which the blessings of God flow to his people on the earth.”2 He began the practice of weekly priesthood meetings in the wards, together with monthly stake priesthood meetings and quarterly stake conferences, to encourage priesthood holders to learn and fulfill their duties. With the death of Brigham Young in August 1877, the First Presidency was dissolved and the Quorum of the Twelve Apostles, with John Taylor as their President, became the presiding body of the Church. Although President Taylor knew that in such circumstances the Twelve as a quorum were then equal in authority to the First Presidency (see D&C 107:22–24), he also knew that the proper order of the priesthood provided that the Church be led by a President and his two counselors. 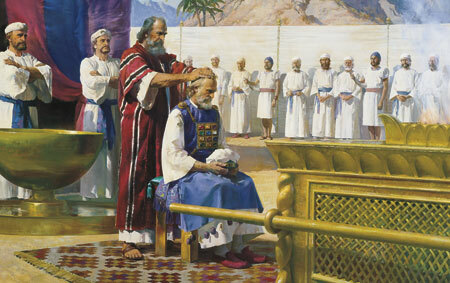 At the same time, he humbly sought to do only the will of the Lord and did not want to take any position unto himself. 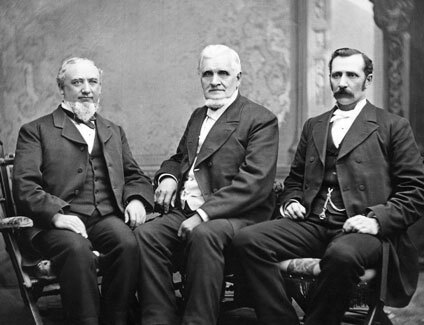 The First Presidency of the Church from 1880 to 1887: President John Taylor (center)and his counselors, George Q. Cannon (left) and Joseph F. Smith (right). He then noted that since the death of Brigham Young, the priesthood had been fully organized, with the exception of the First Presidency and that it was necessary that the quorum of the First Presidency, as well as all other quorums, should occupy the place assigned it by the Almighty. There are two priesthoods, namely the Melchizedek and Aaronic. First.—We find that there are two distinctive general priesthoods, namely, the Melchizedek and Aaronic. … Second—That they are both conferred by the Lord; that both are everlasting, and administer in time and eternity. Third—That the Melchizedek priesthood holds the right of presidency, and has power and authority over all the offices in the church, in all ages of the world, to administer in spiritual things. Fourth—That the second priesthood is called the priesthood of Aaron, because it was conferred upon Aaron and his seed throughout all their generations. Fifth—That the lesser [or Aaronic] priesthood is a part of, or an appendage to the greater, or the Melchizedek priesthood, and has power in administering outward ordinances. … Sixth—That there is a presidency over each of these priesthoods, both over the Melchizedek and the Aaronic. Seventh—That while the power of the higher, or Melchizedek, is to hold the keys of all the spiritual blessings of the church; to have the privilege of receiving the mysteries of the kingdom of heaven, to have the heavens opened to them, to commune with the general assembly and church of the firstborn and to enjoy the communion and presence of God the Father, and Jesus the Mediator of the new covenant, and to preside over all the spiritual officers of the church, yet the presidency of the high priesthood, after the order of Melchizedek, have a right to officiate in all the offices in the church, both spiritual and temporal. It is thus evident that this priesthood presides over all presidents, all bishops, including the presiding bishop; over all councils, organizations, and authorities in the whole Church, in all the world. Priesthood offices have been given for the perfecting of the Saints. The priesthood has been organized according to the order of God. You and I may violate our covenants; you and I may trample upon the principles of the Gospel and violate the order of the Priesthood and the commands of God; but among the hosts of Israel there will be thousands and tens of thousands who will be true to the principles of truth, and God in the heavens, the holy angels and the ancient Priesthood that now live where God lives are all united together for the accomplishment of this purpose. The Lord will roll forth His purposes in His own way and in His own time. And having thus organized, as I before stated, it is not for us to act as we may think individually, but as God shall dictate. Priesthood should be exercised in kindness, with fidelity to God. Why is it important that order exist within the priesthood? How can this order assist each of us in meeting the needs of those for whom we have responsibility? Why are there various offices in the priesthood? (See also Ephesians 4:11–12.) How have you seen that the different priesthood offices assist in “perfecting the Saints”? What experiences have you had in which you were blessed for following the counsel of priesthood leaders, even when you didn’t understand or agree with the counsel at first? In discussing Christlike leadership, President Taylor encouraged priesthood bearers to live by the words “Come, follow me, as I follow Christ.” How can this counsel bless our relationships with our families and with others? How does honoring women help men honor the priesthood? Why does pride diminish or destroy one’s priesthood power? How can we develop the character traits of kindness, long-suffering, forbearance, and love unfeigned? In what ways can we encourage these traits among those with whom we serve in the Church? In what ways can you help the Aaronic Priesthood holders in your family and ward prepare for the privilege of holding the Melchizedek Priesthood? The Gospel Kingdom, sel. G. Homer Durham (1943), 159. Deseret News (Weekly), 28 Dec. 1859, 337. The Gospel Kingdom, 155–56; paragraphing and punctuation altered. Deseret News (Weekly), 8 May 1872, 181. Deseret News: Semi-Weekly, 3 Jan. 1882, 1. Deseret News: Semi-Weekly, 1 June 1880, 1. Deseret News: Semi-Weekly, 8 Mar. 1881, 1. Deseret News: Semi-Weekly, 10 Aug. 1880, 1. Deseret News: Semi-Weekly, 21 Oct. 1884, 1; paragraphing altered. Deseret News: Semi-Weekly, 19 Aug. 1879, 1. Deseret News: Semi-Weekly, 14 Aug. 1883, 1. Deseret News: Semi-Weekly, 24 Mar. 1885, 1.